Sean Penn & Charlize Theron Planning Their Wedding in South Africa? American actor Sean Penn and South African actress Charlize Theron have reportedly been planning their wedding which may take place in the next few months. The couple started dating in in early 2014 and got engaged in November. It is said that Theron’s adopted son, Jackson, already calls Penn “Daddy”. The source said that they just want a low-key, classic and romantic wedding. An Irish couple Patsy O’Connor and Radina Hadzhieva don’t have enough money for their dream wedding in Las Vegas. They try to solve this money shortage by auctioning 6 seats at their wedding on their website starting at $300 each. Their wedding will be on March 16, the day before St. Patrick’s Day. And the 6 wedding “guests” will be invited to go to the St. Patrick’s Day festival in addition to the entire wedding party! Snooki announced on twitter last week that she is now officially ordained. And the reason that she has decided to become ordained is that she is marring her hairstylists Bradley Moreland and Luis Miller in June. Snooki isn’t the only celebrity that become ordained for a best friend though, Kris Jenner, Jonah Hill, Lady Gaga, and Conan O’Brien are some celebrities that you can hire to officiate your wedding! 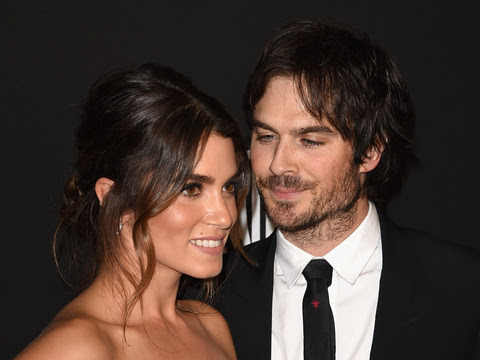 Thirty-six years old Vampire Diaries star Ian Somerhalder is believed to have popped the question to the Twilight star Nikki Reed. Complementing on her boyfriend, “He’s so beautiful inside and out! He’s quite possibly the most amazing man that’s ever walked the planet, it’s crazy. I’m so lucky, I love him,” Said Reed at the Third Annual Catdance Film Festival she hosted. Their wedding is believed to take place in June.